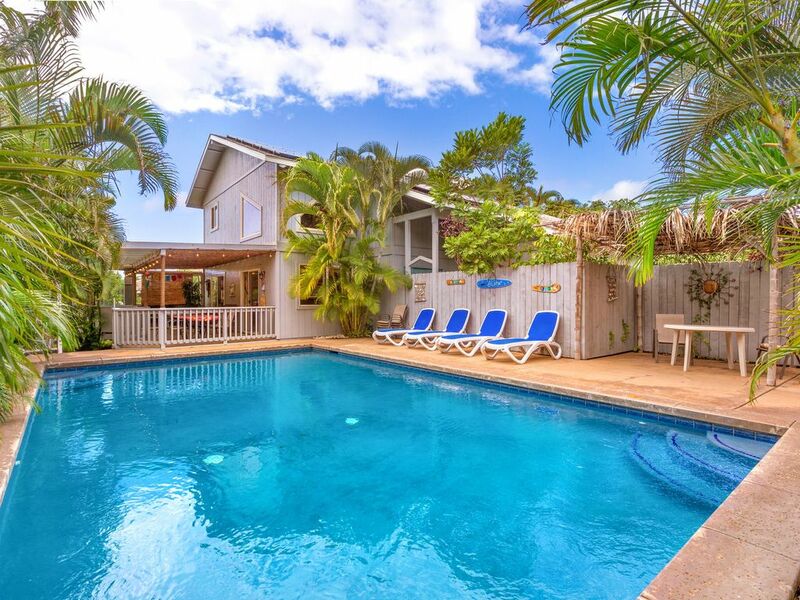 Amazing private 4BR House with Pool, just blocks from the Beach! Hale Makai is bright, open and airy – high ceilings, and tons of windows. Super clean and meticulously maintained with enough space for the whole group to spread out and be comfy, both inside and out. The home was recently redone top-to-bottom and boasts quality furnishings, game room, multiple bedroom configurations, outdoor shower and a great pool – a family-centered gem. Please note that the occupancy limit is strictly enforced (exception for add’l young children possible but must be cleared prior to booking.) This is a quiet residential neighborhood and the owners are committed to minimal impact on neighbors and the home. Absolutely no parties. Please read the rental contract before booking; questions and clarifications are welcome. Aptly named, Hale Makai (ha-lay ma-kai) in Hawaiian it means “Ocean House”; it’s just a short walk from the beach. Warm and inviting inside, and has a whole lot of what makes vacationing in Hawaii so exceptional: outdoor living, relaxing and playing seamlessly integrated into the home. The large swimming pool is the centerpiece for the outside space, and seating and lounging options around the pool are many. Soak up the rays, or chill out in the shade. Pool loungers line one side of the pool, with a large shaded covered lanai with seating and tables at one end. Another smaller covered area with table is toward the opposite end of the pool – perfect for teens or other members of your group to break off into their own poolside space. Tropical privacy fencing and lush landscaping surround the pool area keeping it very private. The gas BBQ grill is located next to the outdoor covered lanai, close to the pool, inside dining area and kitchen. Back inside the house, the master bedroom is on the first floor, and has an ensuite bathroom with a large bamboo, glass block and pebble lava rock shower. The room also has a sliding glass door with private walk to the driveway, the back yard and outdoor shower. The three remaining bedrooms are upstairs. The first has a king bed and each of the other two can be configured prior to check-in either as 2x twin beds or 1x king at guest’s request. The indoor dining area opens right up into the outdoor lanai, where there are two additional outdoor dining tables. The living room also has a sliding door open to the lanai, which brings a fully open flow between the entire common living area and the outdoors. There is a new game room/hangout area on the first floor away from the bedrooms. With ping-pong, a large TV, futon, table and chairs, this is another great place for guests to chill when they’re not at the pool. The game room is a converted garage with a large two-car size door on one side, which is fun to pop open and let the tropical sun and air in. The owners just installed an outdoor shower for rinsing off after the beach or pool – or for the more adventurous, take your morning shower outdoors in paradise! Other places of interest: Beachfront roller skating rink and skate park is 1.5 miles, Cove Park (best place for surf lessons) is 2 miles, Kamaole Beach Park is 2.2 miles, Keawakapu Beach is 3.5 miles, Wailea is 3.75 miles, Big Beach/Little Beach is 8 miles. The airport is 10 miles. The house is set back down a long driveway, and the strategic use of fencing and landscaping keeps the home self-contained and very private. The extra-wide and long driveway also allows plenty of space for groups with multiple cars and, of course, playful children! The owners are concerned with preserving Maui’s environment, and since our island’s electric grid is largely powered by huge diesel generators, the house was recently upgraded to be powered by our tropical sun. Maui thanks you for being green! Hale Makai is really one of those places I absolutely love to tell friends and family about – great memories are made here. It would be helpful, if the ant problem can’t be rectified that maybe provide plastic tubs for food! The house is nice. We enjoyed our stay. It worked well for our family. The plastic tubs for food would be helpful to keep ants under control. Even sweeping daily and storing opened food in the microwave, did not help. I know that hands so soft from Avon helps against ants and flys. Is safe for animals too. You can put it on a cotton ball and rub along baseboards and cabinet areas. 😊 I don’t like the smell but it does work! The home was very clean with nice attributes like pool, ping pong table, good location, air conditioning. Enough room and furniture for 8 people, well stocked with cook ware, plates, towels, beach going supplies, etc. If the game room doors were closed you could not hear the noise in the rest of the house which was nice. Bedroom downstairs could hear people walking in bedroom upstairs. I would not recommend this VRBO if you have people in your group that like to stay up and party after 9, due to Maui regulations that VRBO noise has be very quiet after 9 p.m. Exactly as advertised. Clean, spacious, open home with great pool! Would definitely stay here again. Exactly as advertised. Clean, spacious, open home with great pool! First time in Maui and would definitely stay here again. Just few miles north of Big Beach, where we spent most of our time. Debbie was great too! Thanks for a wonderful family vacation! While we enjoyed our experience there were a few things that were odd. The cash cleaning deposit was odd because they had us do most of the laundry, our own garbage. We rent alot of homes and this is by far the largest cleaning fee we have had to pay and we were asked to do alot. They provided a couple of rolls of toilet paper and 1 roll of paper towels and we had to supply the rest.. We had to sweep every day because they have a serious ant problem. There are alot of rules about being quiet and we had a neighbor constantly watching from his deck that overlooks the pool. The steps to the pool were just painted and VERY slick. My husband fell and hurt his shoulder. When I told the owner she didn't even ask if he was ok. The pool was beautiful. It was Maui so we enjoyed it, but will probably look into a a different home for our next visit. Aloha Kristina - I’m happy you enjoyed your experience and we are so sorry to hear you found “a few things that were odd.” Honestly, I must admit I am confused by your comment. We supply lots of toilet paper, 3 large rolls in each bath, that’s 9 rolls of Toilet Paper. We also let you know ahead of time on your Arrival Instructions that we provide ample amounts of paper products to get you started but if those run out then it would be up to you to purchase your own. The most confusing thing you mentioned is that someone was watching from our neighbors Deck??? There is no deck or neighbor overlooking the pool area at all??? We love our Pool because it is so private and now especially all the Palms and plants surrounding the Pool are super tall and lush. We had no idea your husband fell, had we known we surely would have asked how he was doing. We will definitely look into getting another type of paint for those steps so Thank you for letting us know even if you waited until now. Thank you for the comment about the laundry. We think that is a reasonable request, so from now on we will only be asking guests to get a load of towels started :) As far as the cleaning fee goes, this is a very affordable fee considering all the deep cleaning that goes into the home and outdoor areas for each and every reservation. Speaking of, there is no pest problem in the home, but not sweeping up after children/messy meals is likely what drew ants. We let you know about this as well in our Rental Agreement and in your Arrival Instructions. Maui is a tropical paradise - which comes with needing a little extra attention to cleanup and food storage, and taking trash out to the bins each day. When food or trash is left out for an extended time anywhere, you are guaranteed to always draw ants - this is even true in the posh resorts that spray continuously. Lastly I’m sorry that you found it appropriate to give us only 2 stars when you said you otherwise enjoyed your experience. I truly wish you would have communicated when you were here because we would have come right over and made sure you were super happy in every way possible during your stay : ) We care so much about our Home and providing a comfortable and positive experience for each and every guest and always do our best to make sure everyone is taken care of. Perfect place for 8 family members with three children. Our whole family loved this rental because of the ability for privacy for each individual, the game room, the pool and the covered deck for outdoor dining. There were a lot of snorkeling equipment as well as toys for the swimming pool. The location was near the beach area and privacy. The owner was terrific and friendly and accommodating.